It’s looking like the striper bait bite will be better than last year as schools are setting up early in the main channel. Some schools will be a better quality than other schools as far as size, fight and edibility goes. For me, I prefer to troll when looking for a quality stripers. Having allot of anglers on Lake Powell early helps to thin out the skinny ones too end by June. This means bigger and fatter fish in deeper water are the target on bait. My flyfishing report guess is chumming “Florida Style” should be good for the channel fish schools after water temps hit 60+ up until mid June . Sight and graph fishing on the fly May & June in the backs of the canyons. Extreme low water has the cut closed probably till June but watch www.wayneswords.com to check for all reports to water levels and his current fishing report. The early trips forcing us to bypass the shortcuts at Castle Rock will limit our fish cleaning time due to the extra distances of each charter. It will now be 1 hour to get to the mile marker 12 instead of 15 minutes so be sure to discuss your trip itinerary with you your guide. I am currently out scouting now that the weather is warming up and looking for my “schools of fish”. Hope to see you on Lake Powell this year. Visit our Facebook Page (lakepowellfishing) and see our new Video Ad. 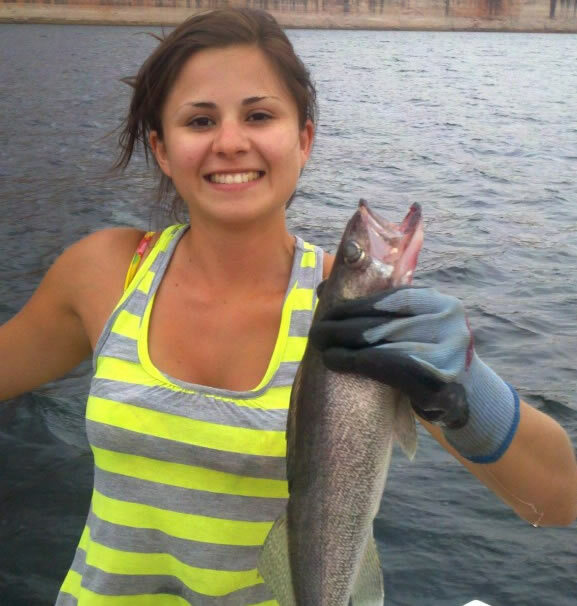 Also visit my website page for our new “Lake Powell Experience” which is fishing and sightseeing something for all the family.